After SEE result 2073, students are engaged in selecting colleges for their further studies. Students must have sufficient grades to join colleges. There are different requirements for studying different subjects after SEE result. 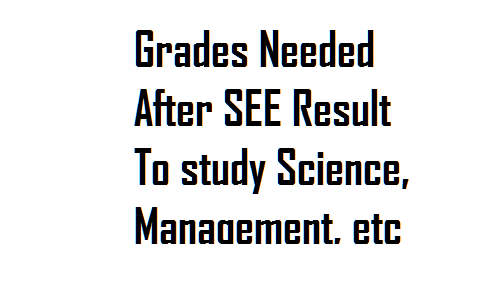 If students wish to study science after SEE result, student must have 2 GPA. Here is the complete requirement of grades that students need to have for different subjects like Management, Humanities, Education, Health, Nursing, Engineering. To study Diploma Engineering,�at least C is needed in Maths and Science and D+ in English. You can share this to your friends so that they can know about it. Good luck for your career.